LAFAYETTE, La., September 19, 2018 – ​When the Music Cities Convention arrives in Lafayette next month, it will land in a music city steeped in history (Zydeco and Cajun) and bubbling over with new ideas and artists (Givers, New Natives, The Shrugs). 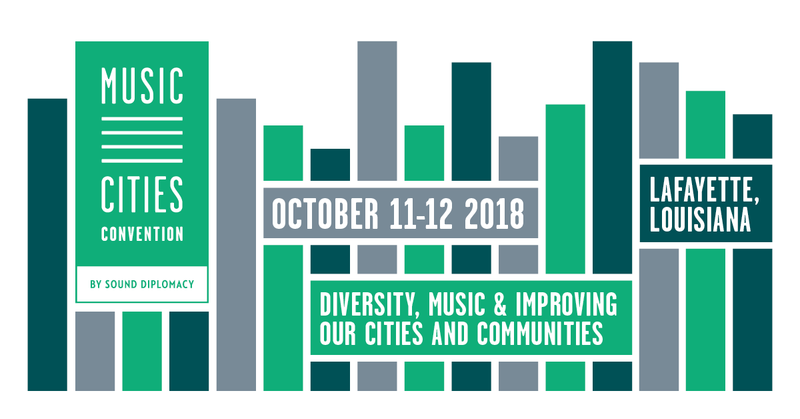 The attendees – who’ll be traveling to Louisiana from six continents – will get an inside look at this emerging hub of new music during the convening, which will focus on Diversity, Music and Improving Our Cities and Communities Oct. 11-12. To kick off the convention on Wednesday, Oct. 10, attendees will be invited to a 5:30 p.m. reception at Blue Moon Saloon featuring live music with Horace Trahan and the Ossun Express, food and beverage, plus a Cajun Jam beginning at 8 p.m. The weekly Cajun jam at the Blue Moon attracts some of the area’s best musicians as well as folks from around the globe. Open to all, the jam allows players of all skill levels to sit in and play Cajun tunes the way they used to be played (comme dans l’vieux temps), all acoustic on the back porch. On Thursday, Oct. 11, after the first day of convention programming, attendees will enjoy a reception at The Warehouse 535, featuring singer-songwriters showcasing their new music created at the 2018 SOLO (South Louisiana) Songwriters Festival, followed by An Evening of Lafayette Music Highlighting the Caesar Vincent Project with nearly 30 local musicians and the unofficial kickoff of Festivals Acadiens et Créoles. On Friday, Oct. 12, the Boudin Cutting festivities in Girard Park kick off Festivals Acadiens et Créoles. Music Cities Convention – though it moves to a new city each year – is always scheduled adjacent to a local festival to encourage attendees to stay in the host city for a weekend of live music and culture. The conference programming will take place during the day on Oct. 11-12 at Acadiana Center for the Arts. The event is hosted by the Lafayette Convention and Visitors Commission and the CREATE Initiative of Lafayette Consolidated Government, with generous support from The Recording Academy and American Nonsmokers’ Rights Foundation.